IUF affiliates from Kenya, Ouganda, Tunisia, Ghana, South Africa, Burkina Faso, Niger, Mali, Bénin, Togo, Nigeria, Cote d'Ivoire, Zambia, Malawi, Senegal and Tanzania present at the IUF African regional committee meeting in Togo show solidarity with the ongoing fight of the unfairly dismissed workers at warehouses in West Bengal, India contracted to PepsiCo! The IUF Secretariat organized a workshop with Solidarnosc members on November 24-25, 2015 in Warsaw, Poland and Solidarnosc shop stewards and members joined the actions of "STOP PepsiSqueeze!" campaign in support of PepsiCo warehouse workers in India. The IUF affiliates that participated in the National Dairy Workers Meeting in Mumbai, India show solidarity with the unfairly dismissed workers at warehouses supplying PepsiCo in India. 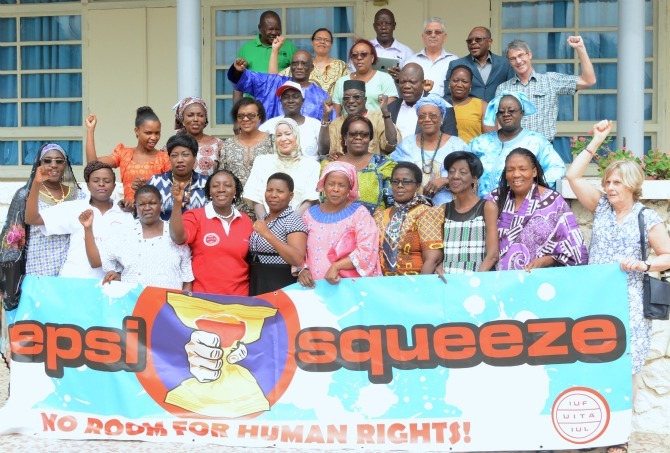 Global Labour Institute Board meeting held on November 20-21, 2015 marked the “STOP PepsiSqueeze!” campaign for justice for workers at warehouses in West Bengal, India contracted to PepsiCo! The IUF affiliates that joined the IUF Trans-Tasman Food & Beverage Meeting in Melbourne, Australia on November 12, 2015 saluted the ongoing struggle of workers at warehouses in West Bengal, India contracted to PepsiCo who were sacked after forming a union. Pakistan Food Workers Federation's Governing Body salutes the ongoing fight of dismissed warehouse workers supplying PepsiCo in India! IUF-affiliated National Union of Workers members stand up for workers' rights in India. On November 11 2015, Executive Committee members of KCTWU Dongsuh Foods Union Jincheon Chapter in Chungbuk region, Korea expressed their solidarity with the dismissed warehouse workers supplying PepsiCo in India! 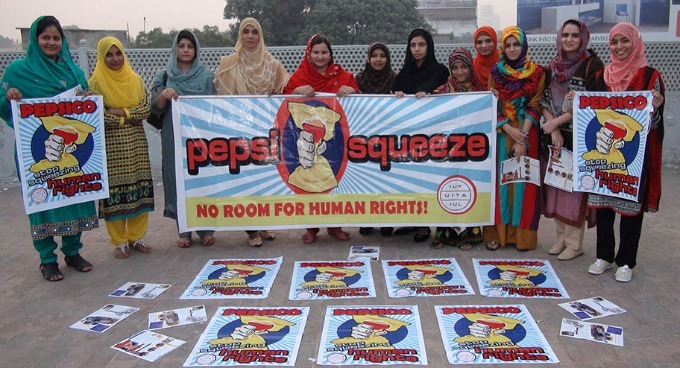 Women members of the Pakistan Food Workers are in solidarity with the 'STOP PepsiSqueeze!' international union campaign during Women's Training on 9 November, 2015 at Lahore, Pakistan. Murree Brewery Workers Union in Rawalpindi,Pakistan demanded the dismissed warehouse workers be reinstated or offered new jobs with full compensation and guarantees that their rights will be respected. On November 5, 2015 the Islamabad Hotel Employees Union showed solidarity with the dismissed warehouse workers supplying uniquely to PepsiCo in India. 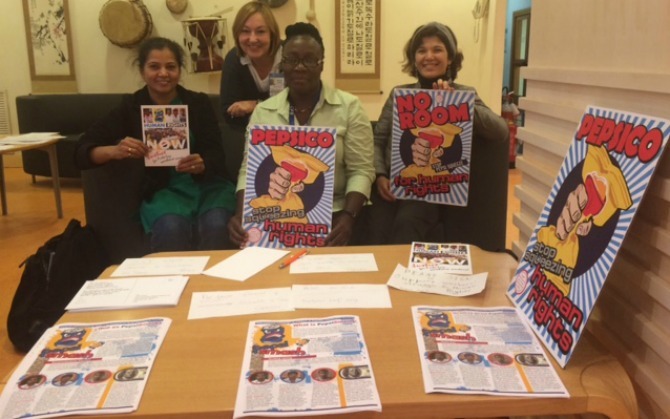 IUF-affiliated union members signed the campaign postcards. 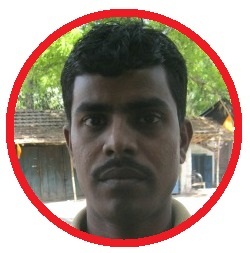 Satyajit Debnath, the father of a young child, dreamed of building a real home to replace the bamboo structure he lives in with his family. He was saving for this while working at a warehouse in India contracted exclusively to PepsiCo, but was sacked for defending his rights as a worker. Now he worries if the flimsy hut they live in will survive the monsoon rains. SEND A MESSAGE TO PEPSICO! IUF affiliates organized in Unilever support the struggle for union rights at PepsiCo warehouses in West Bengal, India. Three union representatives of the PepsiCo plant union in Punjab, the President Vikram Singh, Organizing Secretary Harinder Singh and the Treasurer Raghubir Singh visited PepsiCo (Frito Lays) Workers Action Committee Members on October 25-27 2015 at Dhulagaarh. Union representatives that joined the conference of the food and processing industry workers union of Ukraine expressed support for the ongoing struggle in India on October 22 2015. National Council of the IUF-affiliated Novoprof from Russia signed the campaign postcards in support of PepsiCo warehouse workers in India. General Assembly for IUF European Region (EFFAT) Tourism Sector attended by IUF affiliates from Austria, Cyprus, Croatia, Denmark, France, Finland, Italy, Montenegro, Malta, Slovenia, Spain, UK demand the dismissed warehouse workers handling only PepsiCo products in West Bengal, India be reinstated or offered new jobs with full compensation and guarantees that their rights will be respected! Unite Food, Drink & Agriculture National Industrial Sector Committee meeting held on October 21, 2015 protested the ongoing human rights violations at 3 warehouses handling only PepsiCo products in West Bengal, India. Frito Lay Channo Punjab plant workers organized by the IUF-affiliated Pepsico India Holding Workers Union showed their commitment to support the "Stop #PepsiSqueeze!" international campaign at a meeting attended by around 180 workers in two shifts at the union office. PepsiCo Channo union committee plans to go to Kolkata and visit the PepsiCo (Frito-Lays) Workers Action Committee members. 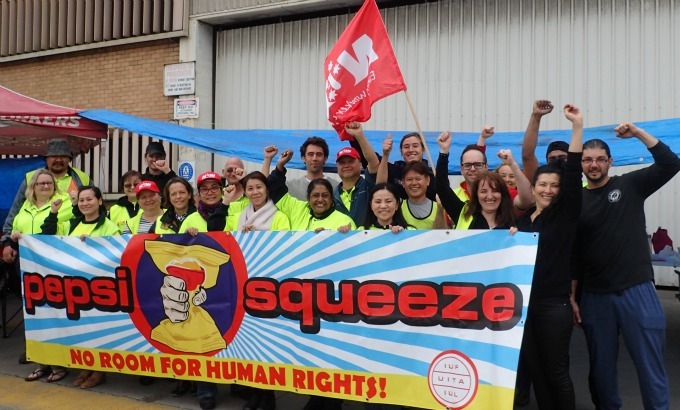 The IUF-affiliated Korea Chemical & Textile Workers' Union together with its members at the subsidiary of AB InBev joined the solidarity actions taken by the IUF affiliates in support of the unfairly dismissed PepsiCo warehouse workers in India on 16 October 2015. The IUF delegation to the 2015 Committee on World Food Security Civil Society Forum set up a Pepsi stall to talk with the 200 plus participants about the "Stop #PepsiSqueeze!" international campaign in Rome on October 10-11, 2015. The campaign leaflet was distributed and participants signed the postcards in support of the campaign. IUF affiliates from the Americas, Europe, Asia and the Pacific gathered in Chicago on October 13-14 for the 3rd IUF global meat conference. Union representatives at the conference showed solidarity with workers at warehouses in West Bengal, India contracted to PepsiCo who were sacked after forming a union. Participants signed the "Stop #PepsiSqueeze!" campaign postcards to call on PepsiCo to reinstate all members of the PepsiCo Frito-Lay workers action committee now with full back pay and guarantees that their rights are respected. 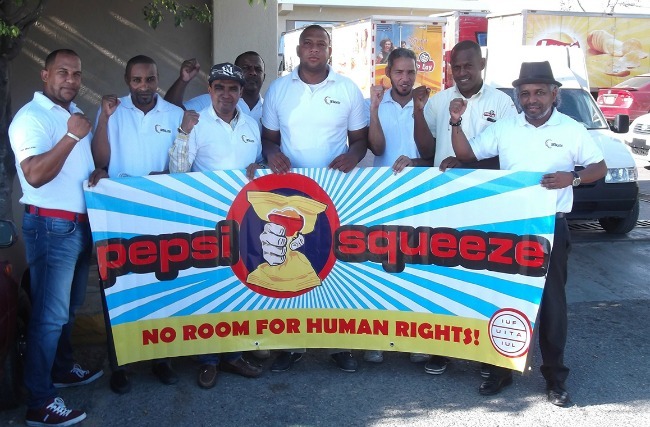 The IUF Latin America Executive Committee meeting held on October 11-12 2015 in Dominican Republic saluted the struggle of PepsiCo warehouse workers in India and showed solidarity with the PepsiCo (Frito-Lays) Workers Action Committee and the "Stop #PepsiSqueeze!" international campaign launched by the IUF. The IUF-affiliated SINTRALAYDO that represents Frito-Lay workers in Dominican Republic organized a solidarity action in support of the unfairly dismissed PepsiCo warehouse workers in India on October 10, 2015 in front of the company premises. The union distributed the campaign leaflet to workers and promoted support for the "Stop #PepsiSqueeze!" campaign. The IUF organized its Asia Pacific regional committee meeting in Hong Kong on September 17-18, 2015. IUF affiliates from Australia, Japan, India, Philippines and Hong Kong showed their solidarity with the ongoing struggle of PepsiCo warehouse workers in India. Union representatives agreed on how to support the "Stop #PepsiSqueeze!" campaign. The IUF affiliates are committed to campaign for as long as it takes to win justice for these workers. Thirty-four year old Gautam Sardar has paid a steep price for standing up for his rights. 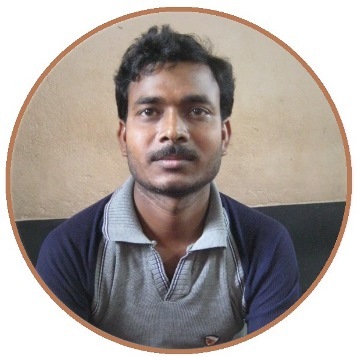 Formerly employed as a worker in a warehouse in West Bengal, India contracted exclusively to handle PepsiCo FritoLay products, Gautam was one of 162 workers who were sacked in 2013 for joining a trade union. In response to national and international protests organized by the IUF, the workers were told they could return to work on condition that they signed statements declaring they would never again join a union, tore up their union cards and walked on them when they entered the warehouse. 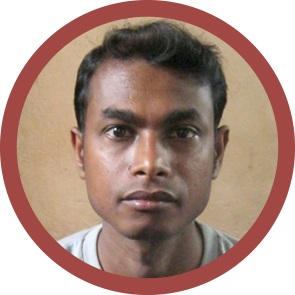 Gautam and 27 others refused these illegal, humiliating conditions and with the support of the IUF founded an Action Committee to fight for their rights. IUF members participating in a global meeting of unions representing PepsiCo workers held in Geneva September 29-30 pledged to continue their support for the Indian workers, and pointed to a number of other potential issues at the company. 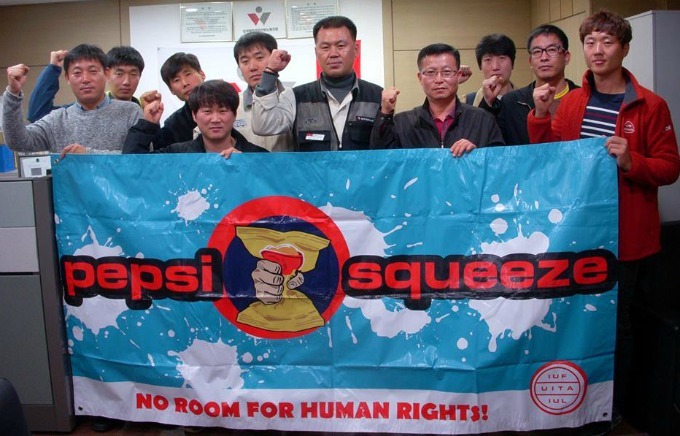 The message to PepsiCo is a simple one: respect human rights throughout your operations and in your supply chain! PepsiCo has been issued a warning letter by the US Food and Drug Administration over "serious violations" at its Tennessee Frito-Lay factory. The letter from the FDA, dated 4 August, revealed violations of FDA's requirements on manufacturing, packing, or holding human food. A Pepsi factory in the city of Valencia said it shut down operations in August because it’s not able to purchase bottle caps or parts for cans. Two other Pepsi bottling plants are also reportedly at risk of shuttering for similar reasons. PepsiCo Company in São Paulo city has initially failed to reach a wage agreement with the workers. After the mobilization of workers at São Paulo factory, the management communicated with the Food Industry Workers Union seeking an agreement. After a long preparatory process, a large number of workers at Frito Lay Group Company Ltd., a subsidiary of PepsiCo in Guatemala, decided to organize and form a union.The new Frito Lay Group Company Ltd. Workers Union (SITRAFRITOLAY) was formally registered on February 2 after organizing its first general assembly and appointing board members. The annual report on the situation of human rights in the Dominican Republic, presented on 10th December 2014 in Santo Domingo by the National Human Rights Commission (CNDH-RD) stated that Frito Lay Dominicana SA (PepsiCo) had disrespected the right of freedom of association in 2014. 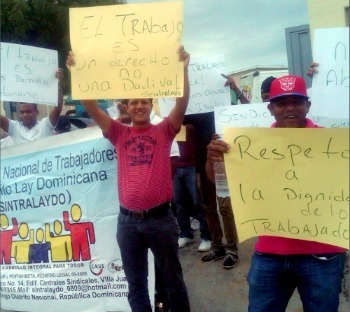 The CNDH-RD report noted concerns of serious setbacks in trade union rights in the Dominican Republic. The report also noted that major violations take place in the hotel and construction industries as these sectors usually employ undocumented Haitian workers whom hardly claim for violation of their rights. PepsiCo is reportedly planning to cut jobs at its office in Chicago as part of its plans to cut USD 8 billion in costs by 2019. Supported by the IUF, the PepsiCo (Frito-Lays) Workers Action Committee continues to hold actions in defense of their members' rights. The Action Committee was formed last year in response to mass dismissals after workers formed a union at PepsiCo snack foods warehouses in West Bengal. Under pressure from an international campaign, workers were told they could return to their jobs if they renounced forever their right to form or join a union. Members of the IUF-affiliated National Union of Workers (NUW) have ended their occupation of the lunchroom at PepsiCo's Smith's snack foods warehouse in the Brisbane suburb of Tingalpa for the best of reasons - the union has signed an agreement which puts in place an equal pay system for casual workers and converts casual to permanent positions after 12 months. 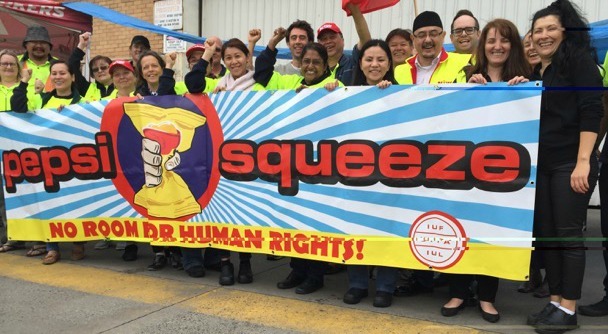 Members of the IUF-affiliated National Union of Workers (NUW) at a Smith's snack foods warehouse in the Brisbane suburb of Tingalpa have been occupying their lunchroom since November 27 in a dispute over equal treatment for casual and labour hire employees. You can show your solidarity with the NUW at Smith's by signing their petition HERE. 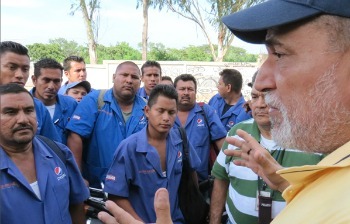 On November 9, 2014 workers at the Nicaraguan logistics company which markets and distributes products made by PepsiCo's flagship Central American bottler Embotelladora Nacional S.A. (ENSA) formed a union in Managua. Within 24 hours the company fired 70 members and leaders. PepsiCo distribution workers in Guyana who are members of the IUF-affiliated Clerical & Commercial Workers' Union (CCWU) have signed the postcards that are prepared in support of Indian workers to call on PepsiCo to remedy the human rights abuses at PepsiCo warehouses in India. The IUF-affiliated Industrial and Commercial Workers' Union (ICU) in Ghana organized a solidarity action in support of unfairly dismissed PepsiCo warehouse workers in India on October 2, 2014. The solidarity action gathered workers and union leaders from PepsiCo factory and union leaders from ICU. A worker at the Olam Interntional sugar mill in Kolhapur (Maharashtra) India was killed by falling sugar bags in a workplace accident on August 8 which also severely injured two other workers. According to the union representing plant workers, the factory has a long history of workplace accidents. But Singapore-based Olam, a major transnational commodity processor and trader, last year received a USD 120 million loan from the World Bank's private lending arm IFC, whose lending criteria ostensibly include safety, social and environmental safeguards. Punjab Food Workers Alliance held a meeting in Nabha-India on August 21, 2014 and Alliance members joined the solidarity actions taken by the IUF affiliates in support of unfairly dismissed PepsiCo warehouse workers in India. Nestle Federation in India showed solidarity with the struggle of PepsiCo (Frito-Lays) Workers Action Committee during its meeting in August. IUF-affiliated Food and Allied Workers Union (FAWU) in South Africa organized its National Executive Committee meeting on June 7-8 in Johannesburg. National Executive Committee members discussed and agreed how to support the "PepsiSmash Campaign" and the ongoing struggle of the PepsiCo (Frito-Lays) Workers Action Committee in India. Ukraine Women Workers Conference was held in Ivano-Frankivsk on June 12 where the IUF-affiliated Agro Industrial Workers Union members joined the solidarity actions taken by the IUF affiliates in support of unfairly dismissed PepsiCo warehouse workers in India. During the first Congress of IUF-affiliated Novoprof which was organized on June 28 in Omsk, the leadership and the Congress delegation saluted the struggle of PepsiCo warehouse workers in India and showed solidarity with the PepsiCo (Frito-Lays) Workers Action Committee and the "PepsiSmash" international campaign launched by the IUF. 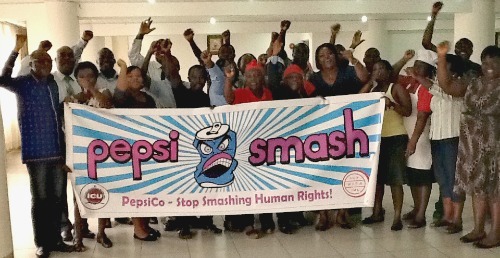 The IUF's affiliate in Nigeria, Food, Beverage and Tobacco Senior Staff Association (FOBTOB) made the "PepsiSmash Campaign" the focal point of its quarterly plants' leadership meeting held on 21 June, 2014.